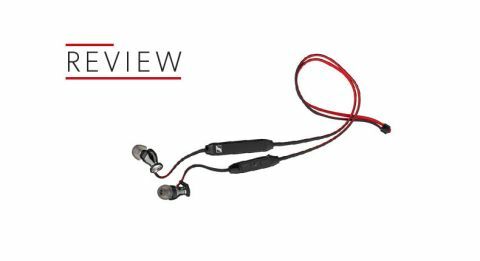 Sennheiser Momentum Free review | What Hi-Fi? It’s hard to believe Sennheiser’s Momentum range of stylish, street-savvy headphones has been around for barely five years. In that short space of time we’ve seen (and heard) it all, including on- and over-ear, in-ear and, let's not forget, wireless and noise-cancelling models too. In fact, the Momentum range already boasts a pair of five-star, Bluetooth in-ears – the Momentum In-ear Wireless – so does it really need another pair? The Momentum Frees (also known as Sennheiser M2 IE Free, and furthermore also known as Sennheiser M2 IE BT - so be sure you and your retailer understand each other) offer similar features and functionality to their siblings. The only key differences are styling and battery life. The Frees have an unfussy, simple design, with a single short length of cable running between the earpieces. You can adjust the length via the attached slider, and can choose to run the cable either behind your neck or under your chin. The In-Ear Wireless, on the other hand, use a chunkier neckband design which sits on the back of your neck. They feel more intrusive, whereas the Frees are more flexible and easier to roll up to stow away in a pocket or bag. The main thing you sacrifice with the Frees is a few hours of battery life – the drop from ten hours to six could be something to bear in mind. But if this isn’t a major issue, and you’re a fan of the simple styling, then you’re going to be well served by the Momentum Frees. The box below the right earpiece hosts an in-line mic and controls for music playback and volume. A long press on the top or bottom buttons skips track and a short one changes volume. Tapping the middle button plays and pauses when you want to answer a call. When they’re not pumping music into your ears, you can connect the earpieces to each other via integrated magnets. It’s a neat idea in theory, but the execution here is a bit fiddly. It doesn’t take a lot of movement to break the connection, so you might want to use the supplied carry-case instead. The mic also sits too far away from your mouth, occasionally making it difficult for the person on the other end of phonecalls to hear what we are saying. Pairing for the first time is quick and easy. A voice lets you know when to look for the headphones on your device’s Bluetooth settings and, when you power them up on future occasions, it confirms you’re connected almost instantly. The Bluetooth receiver and battery have been kept away from the earpieces, allowing Sennheiser to design them in an identical way to the buds used in the wired version. This shines through in their sonic character – they have the same powerful and dynamic sound we’ve come to expect from the Momentum in-ears. Play Lenny Kravitz’s Again and there’s a real sense of weight and purpose to each impact from the kick drum, as there is to every chord fired out by the lead electric guitar. You can’t help but tap along in approval. The in-ears deliver an impressive sense of clarity and detail for the money. You can hear every instrument and note clearly defined - these headphones make rivals such as the Bose Soundsport Wireless sound almost thick and muddied in comparison. Even with more compressed tracks, the headphones refuse to get bogged down and still manage to carve out bass, mids and highs with expert precision. We play Main Title and Escape from The Last Jedi soundtrack, and the Sennheisers communicate all the dynamic shifts with ease. The foundations are laid by the weighty drums, the flow of the track dictated by delicate strings before the wind instruments launch the track into the stratosphere. There is a tiny sliver of sharpness at the top end that can be exacerbated by poorer recordings at high volume levels. But it tends to be subdued by general background noise when you’re out and about, and doesn’t spoil enjoyment of the sound. We also use the headphones with a range of video sources, from You Tube clips to BBC iPlayer and Sky Q, without noticing any signs of audio delay when marrying up the sound to video on a smartphone. At the risk of sounding like a broken record, the Momentum Frees are yet another fine addition to Sennheiser’s Momentum family. If you want wireless convenience combined with excellent sound quality, this is another pair you’ll seriously want to consider.